What is the coloured thread in the waistline of your pantyhose? Is it there by mistake? This is highly unlikely since factories are stocked with plenty of threads and stitching is done automatically. No, it’s there on purpose, it’s actually a size indicator. Red, blue, yellow… it tells the factory what size that hosiery pair is before it is packaged. This feature helps with quality control too. 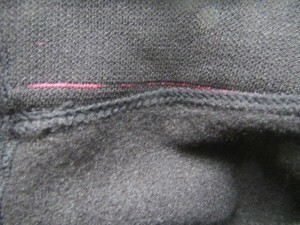 This is a red thread on a pair of fleece lined leggings by Gabriella. My friends, for those of you who celebrate Catholic Easter, have a wonderful holiday. Even though I am not into that kind of stuff, but I figured I’ll at least take the opportunity to de-clutter. Soon you’ll see a whole bunch of my stuff on eBay. 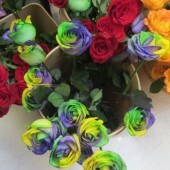 I was out today with my friend and saw these multi-colour roses for sale in an Asian store for Easter. These are called rainbow roses to my knowledge. Do you like it? This is achieved by splitting the stem into multiple parts and dipping each one in a jar with coloured ink. But you know what, I love the natural roses better without any modifications. My favourite is the “tea rose”, the wild one that grows on bushes and smells delicious like raspberries. Not expensive, but classic.